Are you here today for the Friendship Quilt Along sponsored by Moda?…the best fabric company in the world…Okay…maybe I am just a little biased….I want you all to know what a joy it is to be able to work with such an “over-the-top” company such as Moda, United Notions…They truly are the best at what they do and support “us” who work with them in many ways to help grow our “little” pattern companies. 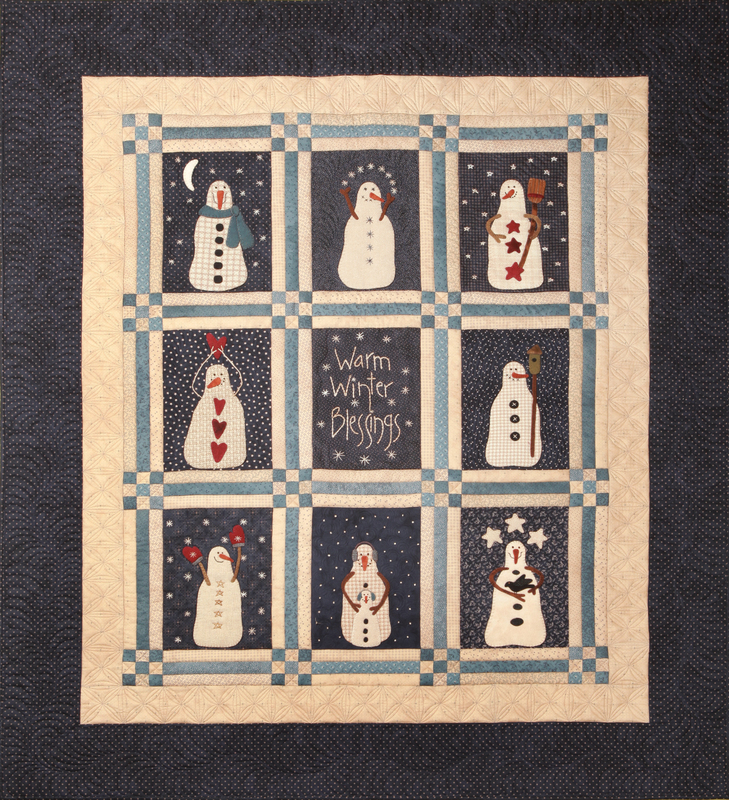 NNow on to the Quilt Along… My Friendship block features our newest line of fabric: Snowman Gatherings. It is to arrive in our stores in April 2013. What I love about this line is that it has 2 cute little primitive snowman prints, but then all the other prints are little “reproductions” of vintage fabrics in 5 color ways, a wonderful deep navy, a union blue, and then three tones ranging from cream to dark tan. The prints consist of motifs that remind me of snow, swirling snow, stars and such… Another bonus is the fabric “goes along” with my other lines…One of the union blues in my block is from “Old Glory Gatherings”. It is nice to be able to collect fabrics…remember you do not have a “stash”…it is a Collection. You never have to feel guilting of having a collection. Collections are valuable! I want to share some photos of Snowman Gatherings that were taken by Camille Roskelley for advertising purposes…They are so sweeeeeet!!! Thanks Camille for your camera talents! Now back to the Signature Blocks…. I just love signature quilts. This is a signature block that I had framed and it hangs in my studio. Back in the day…they had signature stamps. I would love to have stamp created for me…I guess this is a lost art. This was not a “rubber” stamp like we have today…I believe they were made of metal…and could be very finely etched… In the second picture you can see how fine and detailed they were… I have attached a few signature quilts, that I have found, some are antique and some are new…some are little images but just so you can get another idea for a signature quilt. What is a Blog Hop without a GIVE AWAY!!! Moda has generously donated some goodies…Two Layer Cakes and a Dessert Roll….Do you know what a dessert roll is? It is a 5″ strip of 20 fabrics from the line….These are NEW to the Moda Bakeshop offerings………If you wish to have a chance at winning one of these “pretties” please leave a comment in my comment section! If you missed any of my fellow designers posts or need to know where to go next here is a list of the dates and sites…. We also have a Flickr group for you to add your quilt blocks to the gallery. Remember to visit the Moda Cutting Table on March 1st for a finishing layout for all of your Signature blocks!!! Love your block and the wonderful signature quilts. Thanks for the chance! Love, love, love this line. I’m coming your way in mid March and can’t wait to see your shop. Wow, beautiful fabrics,,,,I just have to get some!…smile. I am patiently waiting for the upcoming new website. I go on your site at least 2x a week. Thanks for the opportunity to win some of the new fabrics. The picture of those fabrics is such a temptation. Love the blues! Thanks for sharing all the lovely signature quilts. And thanks for the chance to win. I love the new fabrics and can’t wait to see Moda’s winter gatherings. the new five inch strips is a great addition to the precuts. I’m a sucker for 5 inch squares. I may need to start a new collection for my stash – dessert rolls. I’m glad a website update is in the works to make it easier to view and shop. However, by my bank statements, it appears I’ve done quite well with with old one! LOL! Love your fabrics and my sewing machine is reving up for the next project from Primitive Gatherings. Thanks. Loving forward to making this block…love the fabric! I am a big fan of everything you do. This new line is great! Love your shop, get to it every chance I can. The signature quilts are really neat–I love the idea of a stamp. The colors in this collection are wonderful and so is your block! Wow, that’s a bunch of beautiful quilts! What an awesome post Lisa! Love all of the pictures, but those for the advertising are extra special! Great block! Thanks for so much inspiration! Love Primitive Gatherings! While I don’t usually go for specific holiday prints, I really am intrigued by the snowmen. It would be great fun to use. Lisa I just LOVE your new fabric line….actually I love everything you design! Love your block and enjoyed looking at all of the signature quilts. I love this quilt with all the snowmen. It is going to make a great BOM. Love that dessert roll – dessert is always good. Thanks for sharing the signature quilts. I would love to win i love love your fabric and designs!!! I am enjoying visiting all the different blogs! Who knew there were so many? Thanks for including all the wonderful photos of the signature quilts … The one with the wedding photo. .. what a great idea! The fabrics you show are really nice …. love the idea of 5 inch strips …. a great size option. Can’t wait to see the new site. I visit your website at least once a week for inspiration ! Love your blog and just about everything you do! Would love to win your fabric giveaway. Hi Lisa, I am lovin your new line of fabric! Well to be honest I love all your fabric and designs. This is right up my alley! Thanks so much for all your hard work and all the great ideas. I love the new line of fabric. The friendship blog hop is a lot of fun. Love seeing all the examples of signature blocks. Good Luck with the website update….I thought that might be the case as I clicked on it yesterday. I am excited about the new flannels book. Absolutely delightful fabric, thanks for sharing your signature block. Your snowmen are my favorite. Love your blog! And I am with you on the signature stamp , maybe I am old fashioned but love it! Thanks for sharing your lovely creations! And love the new dessert roll….oh the possibilities! I’ve been anxiously awaiting the arrival of Snowman Gatherings ever since I first saw it a few months ago! I’ve already bought the patterns…now just need the fabric! Love your fabric lines and patterns. Thanks for the chance to win! What a soft textured line. I have saved the block and hope to get to it this afternoon. I feel like a little kid in a candy store when I see your emails. I always look forward to seeing what is new with you. Thanks for another chance to win. What a fun post. Signature block education 101! Thanks for the chance to win this wonderful collection, fingers crossed ! What a fun post! Love the idea of a signature stamp! Thanks sor the chance!! You are soooooooooo talented! I can hardly wait for your new Snowman Gathering fabric to arrive…it is darling! Thank you so much for all you do in the quilting world. You are indeed one that I follow:) Have a super day Lisa! Your work is so beautiful and so is the fabric. Thanks. Love this fabric and the block! I would love to use this fabric to make my sister a quilt! Thanks for showing all the lovely signature quilts. I like those different blues in your new line. I love all the pictures! And can’t wait for your new fabric line. Thanks for the giveaway. I loved seeing all the signature quilts. Thanks for the giveaway. Your new collection looks beautiful! I can’t wait to get started on these blocks! I love the blues! Thanks for the giveaway! I love your new fabric line and block! Thank you for showing us all of the signature/friendship quilts! Hope I win some of those goodies! Blues and snowmen, does it get any better than this? I love the wedding quilt idea! A keepsake for many years to come. Thanks for the chance. Thanks for the giveaway. I’d love a chance to win! Love your new line and the snowman quilt; can’t go wrong with snowmen. I was glad to hear you are having problems with your site (sorry)….. I thought it was me and my computer! I go to your site almost every day and I really like the look of your original “brown” site. I love the snowman! Anxiously waiting for the fabric! Luv your BOM’s and BOW’s! Looking forward to shopping on your updated website. The new fabric line is wonderful, as are all of your fabrics! My sisters and I use your primitive muslin line (especially pie crust and paper bag) as our go to staple in every little quilt we make. Thanks for your block pattern and a chance to perhaps win some fabric! Great block and stunning fabrics! Thanks for the block pattern and the chance to win. LOVE LOVE LOVE your fabric lines! Keep up the fabulous work! Love your new fabric line! I will start planning what quilt to make with them! Also your framed signature block is lovely. Lisa, I was fortunate enough to see the Warm Winter Blessings in person. It is beautiful!! Good luck with your website upgrade!! Love, love, love your site! I haven’t been disappointed with anything I have ordered. Keep up the fabulous work!! Can’t WAIT for the Warm Winter Blessings BOM to start! And of course would love to win some of the Snowman Gatherings! Thanks for the opportunity, Lisa! Lisa, as usual, your blog is “over the top.” I look at your blog first thing in the morning and several times during the day, as it is my favorite. Thank you for all you do for quilters and your family too. I love the block you have created for this Quilt Along. Thanks too to you and Moda for a chance at some great fabrics to win. Looking forward to your new fabric coming out. Love the snowman quilt! Hi Lisa, I love signature blocks! I share your wish that those fine stamps would be made again by someone who knows how to do it. Perhaps some reader got inspired by this post and gets to work…That would be something, wouldn’t it? I love your snowman line. thanks for a chance to win. Love the fabric. Blues and browns/tans have been calling my name lately. Would love to win some. Thanks! The new fabric looks fantastic–my favorite color combo! How neat!! Love the signature quilts! My local quilt shop is going to do your snowmen as a BOM and, like you, we are all chomping at the bit waiting for the fabric so we can get started. Love the snowmen! Nice block, and nice blue fabrics!! I fondled my Snowman Gathering fabric just yesterday! Can’t wait till your new fabric line is available. I love the signature quilts you have. So pretty. Hi there. I want to you know that I’m a fairly new quilter, and, until recently, hadn’t sewn using any of the more traditional fabrics. This past summer, I picked up a pack of Old Glory Gatherings, and LOVED it, so I am anxiously awaiting the Snowman Gatherings release. Thanks! Blue is my favourite colour so I just love this fabric. Thanks for the block design and the giveaway. 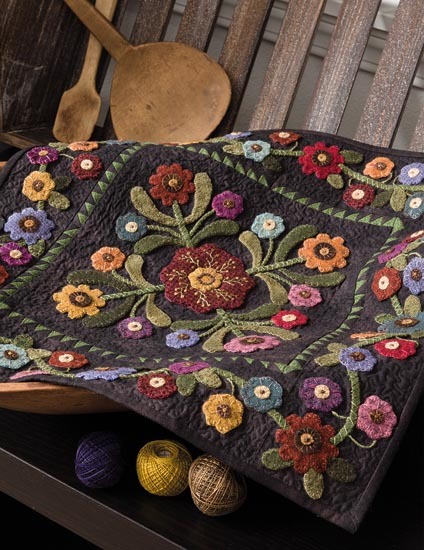 I was really not very aware of signature blocks/quilts, but what a fabulous story they have to tell. Thanks for showcasing them, your lovely fabric and the fun block! I also love the idea of the dessert roll – leave it to Moda! Thanks for the chance to win! Dessert rolls – what could be better? Love your fabric Lisa. LOVE sig blocks, thanks for sharing all of yours! Your block is very pretty, cannot wait to put my hop quilt together! Have a fun stitching day! Oh, thanks for sharing! I simply adore the Snowman Gatherings collection…too cute! I also enjoyed seeing all the pictures of the signature quilts. What I would love to see is a post with a ‘tour’ of your studio. Not sure if you have done that already but I don’t remember seeing one since I’ve been following. Love the new line. Can’t wait until it arrives! I luv luv luv your snowmen! Even tho we rarely have snow here, (Houston) when I see a snowman, I always think WINTER:) & it makes me smile! Thanks for the blog! I just love this new fabric line. And your block is one of my favorites. Thank you so much. Lisa, just love everything that you design! So happy to hear that you are coming to the Pittsburgh area later in the year. Your snowman gatherings is just lovely as usual. Have done several of your patterns including the Primitive Garden and love them all. Would be wonderful to win something, anything. I love snowmen and your new fabric is terrific! Thank you for the opportunity to win some. I would love to win! You have such talent. Love your work. Thanks for the give away. Can’t wait to see the Snowman Gatherings when it comes out! Thanks for the pattern. Once again you’ve designed something so amazing.!!!! You are truly one of my favorite fabric and pattern designers. Thanks for sharing a view of where you stitch, too. Can’t wait for the fabric to hit the stores. Totally in love with the new fabric line and all the patterns you’ve designed to go with it. Will be adding to my snowman collection soon. Can’t wait to see all of it in person. Thanks! Thank you for your nice block !! All your collection is so beautifull … too cute your Snowman ! Thanks for the great pictures of signature quilts Lisa. I saw the one with the large stars at the Internation Quilt Museum in Lincoln, it is a wonderful quilt. The block you are sharing is great, I may have to go back and print the rest off. I enjoyed looking at all the pretty quilts on your site. Lisa, your designs are so amazing. There isn’t anything you design that I don’t feel like I just have to have!!! Thank you for your beautiful fabrics, wool, summer BOW which I am already salivating over … and now the chance to win your special dessert rolls & fabric packs! Thank you thank you thank you!!! Love your signature block & the snowmen collection! Hugs & blessings to you & your wonderful shop gals! Such beautiful fabrics and I love the snowmen! Looking forward to seeing the new fabric line! Very pretty block. I would love to win some of the fabric. I love your fabrics and designs!! Thank you for sharing. Hi Lisa, you keep me so inspired, I love your patterns and fabrics. I adore this BOM! And the fabrics are just absolutely my tasste! Thanks for the lovely block and the give away! Thanks for sharing the pictures on signature quilts. The quilts are lovely. I have signed your email subscription, and will be waiting for your BOM. I have to agree with you that Moda is the best! LOVE your block..so CUTE! But then all your stuff is wonderful! First booth I run to when visiting quilt festival in Houston. Thanks so much for sharing. Can’t wait for snowman gatherings to get into stores,,,,,,,,,,,,,just love it!! Thanks for sharing your creativity with us!! I love this block and the fabrics are luscious.Thanks you for the pattern and the giveaway!! LOVE, LOVE, Love the Snowman Gathering fabric line and can’t wait for it to be available! I have all ready signed up to make the Warm Winter Blessings quilt at my favorite quilt shop. Would love to win the beautiful fabric! Thank you for all that you do for the world of quilting! Your new line reminds me of a snowfall – snowing from early morning to nighttime, a beautiful snow that makes one want to sit and quilt next to a window. Love the fabric and the block! Cant wait till your site is up. Your block is beautiful and I love primitive work. So glad I found the Moda block series. Would love to win some fabric, like you I think Moda is the best. Awww… I was looking for the one we (your employees) made for you one Christmas! You might have it packed away where you can’t get to it, tho. That’s ok. The ones you posted, tho, are Very vintage looks, that’s for sure. Love your fabric line and patterns. Thanks for the opportunity to win your giveaway. Love your new snowmen fabric line and the BOM looks great. I can see that this snowmen collector is going to have to sign up. Thanks for the chance at the giveaway. Love your fabrics and the colors tht you use! Great work. I have a soft spot for snowmen-haha–and can’t wait to buy some of the new line. i’ve been collecting all of the quilt along block patterns and cant wait to start them—i’ve got a “collection” of reds and creams that will look good in all the blocks. ok-gotta run–kids safely on the bus enroute to school, husband off to work, fire stoked and the house cleaned (not really) and now i’m off to sew—a perfect “ME” day. I am so excited about Snowman Gatherings. I recommend your blog/shop to everyone!! !My dream is to make it to yur shop or at lease a class with you. Thank you for all you do! Love the block and have really enjoyed the blog hop. I agree with you about Moda! I can not wait for this line to come out in the stores!!! EEEKK!! And the bom is one that I will just “HAVE” to do! Thanks for sharing!! Love the fabric and your snowman is adorable. Thank you for a chance to win. This is the neatest block. I have been having fun collecting and will be making all of the wonderful friendship blocks from theblog hop. Thank you for sharing your block with us and giving all your followers a chance to win those layers cakes and the dessert roll. I just imagine what a warm winter quilt I could be making. I love this fabric-and your store! I’m totally in love with the new fabric line! I think I see a Snowman Gatherings FQ bundle in my future…it will look awesome on my shelf next to my Seasonal Gatherings bundle! I have seen lots of signature blocks used in “Crazy Quilting” if you’re interested in looking at those. Thanks for offering this lovely fabric giveaway! I like the new line, and cannot wait until it is available. And I will check out the snowman block of the month since I love snowmen. Thanks for a chance to own some of your fabric. Love Love LOVE the way you design! Your fabrics are my favorite. I’m especially a fan of blues and it’s hard to find just the right shades but you’ve nailed it! I really enjoy and appreciate the way your lines all coordinate. So Many Quilts, So Little Time!!! I Love the new fabric line, I have already signed up for the BOM, and I can’t wait to start. Everybody loves snowmen, and Blues, they are my favorites. Thank-you for designing such beautiful and fun projects to keep us inspired. The fabrics are beautiful and thanks for showing us the signature quilts. Hoping to meet you and take one of your classes in Hershey, PA this year. Wish your shop was closer to PA but online sure is convenient because I cant find most of the things you supply near me. Hope to be a winner! Love the block and absolutely adore Snowman Gatherings. Thanks for a chance to win. I’d love to win some of your fabric! Count me in. I love your block! Thanks for the chance to win! Thank you for the wonderful new fabric line. I already have a great collection of your fabrics. I love the snowman quilt and your fabrics. I can’t wait for you to be in Raleigh, NC, I plan on being there. I love the new line! I can’t wait to make some of the cute snowballs and snowmen! Great block and thanks for the history and photos. I am looking forward to your bom at our LQS. Thanks for the chance to win your lovely fabric. I’ve been waiting oh so inpatiently for the new line! Can’t wait to use it and touch it! Love your snowmen fabric. I am looking forward to this BOM. I love the blues in your line! Camille did a good job photographing your fabrics-thanks so much for the block and the chance to win! Thanks for sharing such a wonderful block! Love your fabric designs and thanks for the chance to win! A Moda Dessert Roll! What a great idea. This will make cutting some patterns so much easier. And another way to own the “Whole” line of fabric. Thank you for sharing all the signature quilt eye-candy. Very cool. Love the fabric in your block–lovely! I can’t wait for the snowman quilt!!! Thank you for the beautiful block and for sharing all the signature quilts. Your fabric is very pretty! Your signature block is beautiful! Hi Lisa, I am such a fan of your work. I have been looking forward to buying some of your new fabric line,Snowman Gatherings, since you introduced it a few months ago. The quilt shop in my town is going to supply it. I can’t wait until it comes in. Thank you for the block and the chance to win. I love the Snowman Gatherings. Can’t wait to see it at the Chicago Show in June. Love your stuff!!!! I love everything you do. The block is beautiful. Can,t wait for the fabric. Sara R.
I took your Snoman Gathering appliqué class in Utah. Loved it. Can’t wait for the fabric to be released so I can finish my quilt. I love the little Snoman all over print. It is my favorite. I also finished my 12×12 mini quilt you so generously gave us at the trunk show. It was fun to make, too. Thanks for some fun quilts time. It’s always fun to read your blog. Can’t wait for the new improved website. Thanks for the beautiful fabrics and awesome quilt photos. Can’t wait for the new line to be in stores! CAN’T WAIT FOR NEW THE WEB SITE. THE SNOWMEN LOOK SO CUTE. I’m new to your blog, and what a pleasure it is to visit! I’m going to stop by often. The photos are just gorgeous, and the fabric line is completely lovable, as are all those snowmen! I love your block and I really love the fabrics in it, those are gorgeous prints. I have some signature squares from our group, now I need to get going and put them into a quilt. I love snowman gatherings. Thank-you for the opportunity to win some of your beautiful fabric. I made my niece a signature quilt for her wedding this past summer. I made all the signature blocks and guests signed them at the wedding. I used the pattern of the last signature quilt that you showed here. She loved it! Love the Warm Winter Gatherings, may have to sign up for it one the site is up. I’ve always been attracted to blues and tans and know I will be needing some of this fabric. I can’t wait for your new line to become available…..so winning some would be sweet!!!! Thanks for the giveaway Lisa…….I just love everything you do! You have a great website. I am anxious to see the new one! I really, really enjoy working on your wool appliqué kits and patterns. The high quality wools and fabrics make them great for the hand stitching that I love to do. It’s always great fun to see your new designs. Thanks! I love the new fabric! Can’t wait to find it in my favorite shops! And thanks so much for sharing the photos of the signature quilts – I can feel another project coming! I can’t believe someone hasn’t picked up on the idea of a signature stamp – that would be so awesome! I am so looking forward to the snowman gathering line. Love, love, love your fabrics and I am crossing my fingers that I could be a lucky winner. See you soon in Florida. I love your new fabric line! Can’t wait until it comes out! Love, love, love the new snowman bom! My juki will be with me very soon! One always needs new fabric as well! The line is awesome!!!!! I love all the great old quilts. And I can’t wait to see your Moda line. Your new line is so cute. Can’t wait to use it. Love the framed block. You have such a wonderful shop. Would love to win that new fabric. Nancy P.
I’ve had the Snowman Gatherings pattern for a while … just waiting for the fabric! Hope I can win it! I am in LUV with your new line of fabric and those adorable snowmen! Your new snowman gatherings is great I can feel my Collection growing! the desert rolls look great. Hi, I’m visiting for the first time and am enjoying seeing your fabric. The snowmen are such fun. Thanks for the information on the signature quilts and the opportunity to see so many love examples. I so want to win the fabric and then make that cute quilt!!!! Love it! Your snowman quilts and fabric are adorable. Your snowmen pics are adorable and your new fabric line will be perfect for the season!! I will definitely be back for the BOM!! Thanks!! I’m excited about this line! So many possibilities – the BOM is great, I may need to make it! You’re right about Moda – best fabric out there! Thanks for the chance to win some. I love the yellow and white signature quilt. There is something about yellow and white. I also love the different shades of black and white. I need to win some rolls of fabric bits so I can sew, sew, sew! Love your fabric designs Lisa. Thank you for the block pattern and the chance to win some fantastic fabrics. Signature quilts are so interesting study down the road. Love the fabric. They’re all so wonderful and special gifts they make for someone special. I love your snowman table runner! Very cute and these fabrics are perfect for that project. I love the new line and appreciate the fact that it goes with other “collections” from you. Thanks for a chance at your drawing. Wonderful collection! Love those snowmen!! Moda Bake — Friendship exchange — Signature Blocks — My printer ran out of ink — Moral of this — don`t print– just Save and SEW !!! I’m a sucker for a cute snowman. These guys are adorable. I’m wondering how difficult the Warm Winter Blessing quilt would be for someone who has never done an applique quilt. I’m not sure which post to leave a comment, so I am leaving this one here too. Love your blog. And your block is so pretty. Hi! Love your projects here,especially the “Snowman Gatherings” ones! Thank you for your inspiration+a neat giveaway too! I love the block and the new fabric line-thanks for the chance to win! The snowmen are adorable. Thanks for taking the time to share the signature quilts, the are very interesting. Do you have a pattern for the cute valance in your sewing room? Is it made from wool? Always enjoy what you share. Thank you. The fabric is so great I’m drooling. Thanks for sharing the signature quilts, very impressive. Love your adorable snowman fabric – the BOM is so cute! Would love to win some fabric! Love the new fabric collection, blue and beige play so well together. Very sweet snowmen. Thanks so much for the chance to win this lovely giveaway. Beautiful fabrics, quilts and adorable snowmen! Thanks for the chance. Love the block! Primitive Gatherings and Moda rock! Love the idea of signature blocks and the intricate detail of the antique block! Thanks for the giveaway! Love the new Snowman Gatherings collection. Can’t wait to get some of that beautiful fabric! Enjoyed seeing the signature quilts, too. Thanks, Lisa! Of course I want a chance to win! Thanks for asking :0). Lovely designed quilt , I have always love looking at inked blocks’and wonder how they have stood the test of time. If only they could talk! Doesn’t everyone want a snowman quilt….love yours and hope to make one for myself one day soon. I love snowmen, but yours melt my heart. I’d love to give them a cozy home with me! Nice pattern and fabric !!!! Good morning. I am a first time visitor and I love your blog. r u the same primitive gatherings that goes to Houston each year? Love the new block of the month and your new line! How cute the Snowmen are!! The “petite” prints in your fabric line are very adaptable to any project. And the colors…I love your fabric, Lisa. Thanks for the block pattern and the chance to win some fabric. Love your block and love the new fabric. Thanks! Hi Lisa! Loved your blog today! I would love to have some snowmen come and live with me here in Alaska! We have lots of quilters here who, just like you, continue to inspire us all. Snowmen Gatherings would be right at home here with me! I would love to win!!! It’s snowing! I would be a good day to be inside stitching your snowmen . Your fabric sounds yummy! 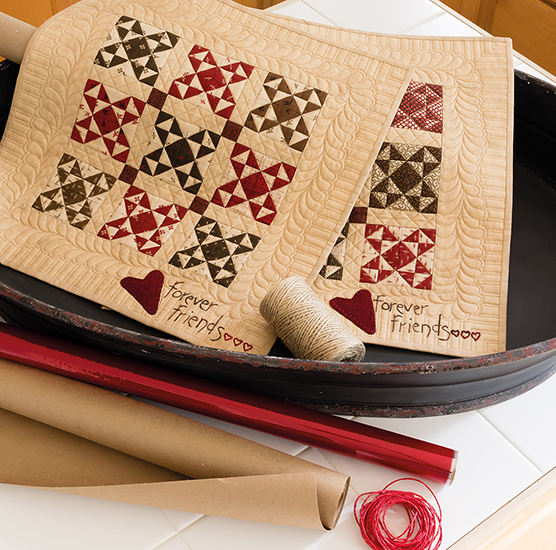 love the signature quilts … and your new line. thanx for the chance to win some new fabric. Your snowmen are adorable. I love your new fabric. Love your fabric and thank you for the opportunity to win some!! Love your work. Thanks for sharing the signature quilts. Great ideas! Your new line looks wonderful! Love the blue, tan and creams. I would love to add this to my collection / stash. I love the signature quilts you posted pictures of. Thanks for the giveaway and thank you to Moda also. Have a great day! Love all of your old stuff….especially the quilts!!! ( I saw your Christmas pics.) I love old stuff too!!! And your snowman line of fabric and your patterns are perfect for the winter we are having here in Wisconsin. I love blue – just my absolute favorite color, so I love your fabric. And the snowmen are adorable. Thanks for the giveaway. Many thanks to both you and Moda for the opportunity to win some of your new fabric line. What fun! Really appreciate the look at the signature quilts. Thank you for the chance to win. Fell in Love with these sweet snowmen! Signed up for email updates. Can’t wait for patterns to be available. Thank you! I love your shop and your BOW’s and BOM’s. Wish I could do them all. I can hardly wait for your snowman fabric to arrive. It will be so much fun to use in projects. You are so creative and talented. Looking forward to the snowman collection coming out. Love your quilt ideas. Thanks for the chance to win some beautiful fabric! Thanks for sharing the pictures of the quilts and the information on the stamps. I am so excited to know that in less than a month, myself and 2 of my “quilty friends” are planning a trip to P Gatherings!! HOORAY!!! Finally and it will be a first for all 3 of us. I have recently been dabbling with wool so am anxious to pick up some things to support what I am afraid is one of my newest habits! Now I just hope the weather here in WI will cooperate. Thank you for the wonderful block pattern. When I looked at the fabric on the Moda website, I did notice only two snowman prints and the others were wonderful fabrics that can be used for other blocks. Thanks also for seeing the signature quilts. I do find the signature stamps to be an interesting way to sign a quilt block, but I also like seeing the signature “embroidered”. I once saw a signature quilt with the name stamped, and the signature embroidered under. I also love signature blocks. I loved everything you posted about today! 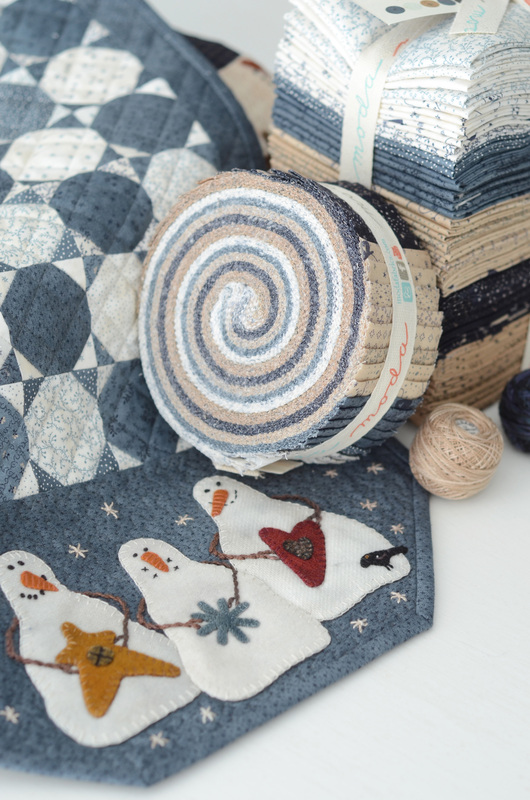 The fabric “Snowman Gatherings” is wonderful! I would love to win it! I appreciate all the pictures of the different signature quilts. It’s on my list of quilts to make, but I haven’t settled on a pattern yet. With this blog hop, I’ll get some great ideas. I also liked the pictures of the Snowman Gatherings fabric. I’m really looking forward to this coming out in April – and so is my mom! Love this line of fabric, can’t wait until it comes out. Got to make that BOM snowman quilt. Love your signature block, printed off and on my To Do list. I actually have signatures of relatives that I got at a family reunion and need to make a quilt with them, not the right size for your block but did get some ideas from the quilt s you showed. I love your signature blocked framed like that. Love all the signature quilts too. Please enter my in your giveaway. I’m a primitive kind of gal. Sowman Gatherings is wonderful. I think this would be a good project for a hand applique class. I am really enjoying the blog hop. Thanks to Moda and all the awesome designers. I love your signature block. Thanks you for the chance to win some fabric. Snowman Gatherings is so versatile. Love the blue! Love this line and the snowmen. Thanks for sharing your talent, love your block. Lisa–I purchased a mini Snowman Gathering kit from Sew Graceful Quilting. I love the pattern!!! Thank you for the signature block quilt tour. I love your snowman gatherings. The problem is whether to make the full quilt or the smaller one. Decisions, decisions. I love your block! Signature blocks are so fun to make and swap. First time visiting your blog, love it!!! Your blues are so perfect for January quilts of snowmen. Thank you for your great books and designs. I always look forward to your booth at quilt shows. Your snowmen are so lovely and I can’t wait for the collection to come out!!! Thank you for sharing with us! I think those dessert rolls are such a good idea! Great block. Thanks for the chance! 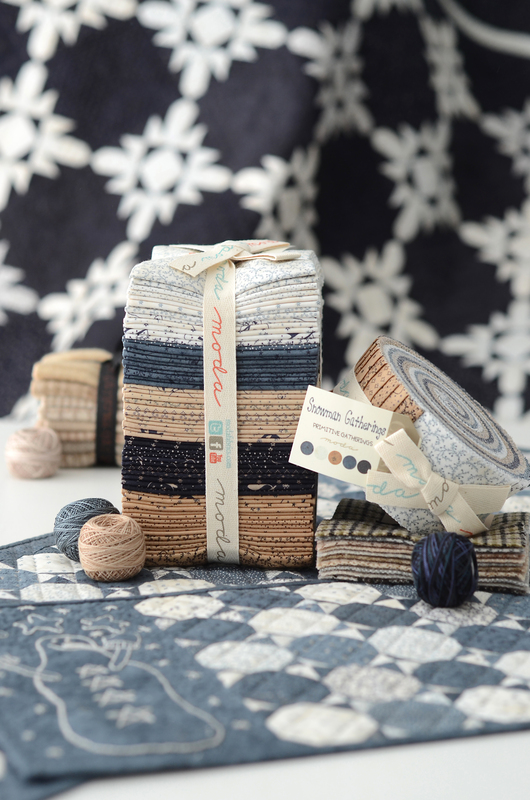 Really like your block and am anxious to see the Snowman Gatherings fabrics. You’ve always got something interesting! Lisa – congratulations on your new line! The colors are my favorite blues, they’re so soothing with the creams and tans. I may wait until the fabric comes out in April so I can make these blocks, won’t it be a beautiful quilt! 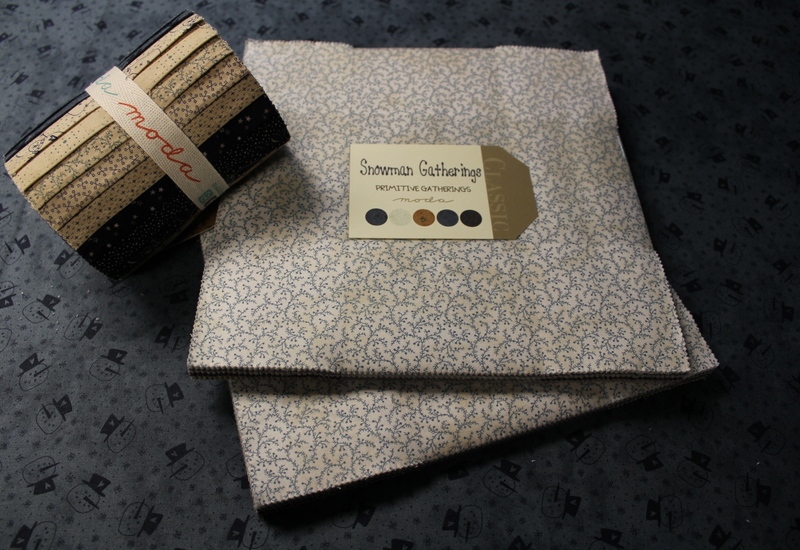 I love the Snowman Gatherings fabrics and have already preordered some of it. Like your signature block too. I love your block Lisa and can’t wait until the fabric gets in. I already bought the patterns! Thank you so much! Oh…who can resist snowman fabrics ??? Love them ! Your signature block is cool ! I have followed your work for years and love all your designs. I would love to win a give-away. I’m checking it twice to be sure I’m signed up. Love, love the snowman fabric! Thank you! Really enjoyed seeing your Friendship quilt collection. Your newest line looks so fun and snowmen are among the best winter designs. Thanks to you and Moda for the chance to win these beautiful fabrics! Fabulous fabric line. Love, love, love it. Hi Lisa! Everything looks so, Lisa!! Love it all! 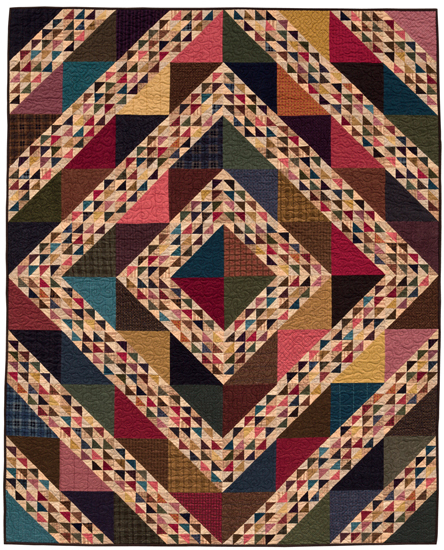 Love the block and the antique quilts – will keep my fingers crossed for one of the draw goodies! Lisa, your Snowman quilt is beautiful! Will be watching for it. Love your block you have selected, also, that wedding quilt! Oh, my! What a beautiful keepsake! 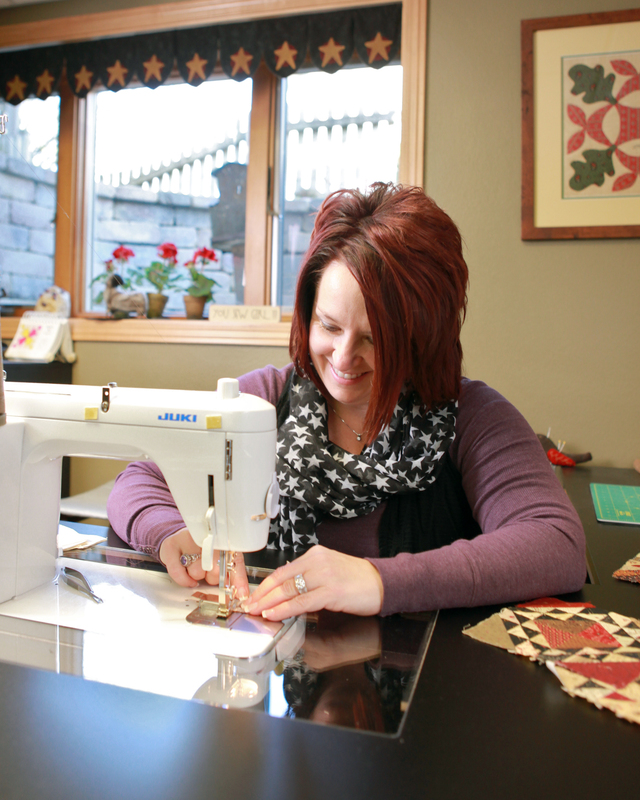 That’s what making quilts is all about for me….providing someone with a tangible proof of your love and caring. Thanks for sharing. I love your block and your new snowman block of the month! It’s so cute! It was fun to see all the signature blocks – thanks for sharing! And, thanks for the chance to win some of your wonderful new fabric! Lisa, I cannot wait to get a hold of your fabric line. I always lean toward the blues and this is right up my alley. If you ask me, there are never enough winter quits to cuddle up with. Looking forward to getting your new line. Great job, we love it!! My mom always loves your fabrics. She has a very country/primitives house, would love to make her something with these fabrics. Thank you for this beautiful block pattern, I really like it alot! And an awesome giveaway to boot! Moda rocks! I love your snowman table runner and the quilt. Thank you for the block and the giveaways! Love everything you do Lisa! Would be thrilled to win your fabric!!! 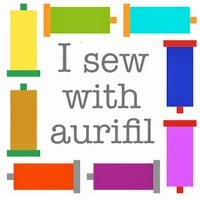 I’m new to Quilting and would be over-the-moon if I were to win your drawing. Thanks! Such cute snowmen and the new fabric looks beautiful. The snowmen are so cute and I love your fabric. Thanks for a chance to win. Great Job! What fun you bring to my quilting world! Your snowmen fabric is perfect for the day that we have been having. Plenty of the white stuff to make several snowmen. Love your fabrics and colors! I am collecting all of the blocks with the hopes that our Loose Threads group will make the blocks together. Thank you for sharing pictures of your beautiful quilts and designs. They are very inspiring. I have had to put my stitching on hold due to studying for my Physician Assistant recertification exam scheduled March 1. Can’t wait until it is over so I can back to doing what I love. I can’t wait for your new snowman fabric to arrive. I’m already signed up for the BOM at Primitive Gatherings and have ordered the thread kit from you shop…very excited!! I love your snowmen! Thank you for your pattern. Love the snowman gathering fabrics and am waiting for the BOM to start arriving!! Although I do not like the cold weather and snow…..I love snowmen. Yours are delightful! Thanks for the block and a chance to win! Love the fabric line. thanks for the chance at this lovely fabric!! Love your new fabric and the BOM snowmen. I have a friend who LOVES snowmen. Just might be using this fabric to make her a quilt. It would be perfect. I am so excited about the new fabrics coming for Warm Winter Welcome and signed up for the BOM! I enjoy your blog soooo much! Thank you, thank you! Love the Lakehouse! Love this line of fabric, but then I love all of your fabric! work with. Thanks for a chance to win some! I love the fabric – you always design such great collections! Thanks for the block, and thanks for the chance to win some of your beautiful fabric! OMG, to win this would almost be as good as winning the lottery !!!! I love snowmen ( not the cold so much), but love snowmen !!! Thanks for the giveaway. I would love to win the “pretties” of beautiful fabric. I love all your designs! I collect snowman and would love to make something from this line. Thanks for the chance! Your snowmen are just delightful! And I like the signature block too. Thanks for the wonderful giveaway. I’m dreaming about those lovely fabrics. cute block. Thanks for the chance. I just love your snowmen and the runner really looks fun. I would love to win the giveaway Thanks so much! I would love to win some fabric! I really like your block. I also think the dessert rolls are a great idea. Thanks for the giveaway. I am so anxious for the new line to come out! I really like your designs! Looks like you’re always having fun making something new! Love the fabric. Thanks for the block. I must agree with you that Moda is THE best!!! That is about the only brand of fabric that I ever buy. 🙂 Your snowmen are SO cute! Have a blessed day! I love your block! The colors are wonderful!!! I just love working with Moda it is always so pretty…Snowmen are my fav to make. I live in Montana so we have snowmen up for a long time…Have a great spring…. My stash needs those prints! Love your new fabric Lisa and the new BOM. Heard some good news about you this past week on the cruise with Rose Ann — you’ll be back in 2014 !! Hope I get to go again !! Hi Lisa oh I have been a follower for some time now…love the block and the fabric….. Thanks for sharing your friendship block. I love it and loved seeing all the beautiful quilts. Thanks for the chance to win a prize. the snow fabric has so many possibilities. Nothing as homey as snowmen in winter. Love your fabric. It is just the right background for those darling snowmen. Thanks for the chance to win! Loved your little smile in the picture. Thanks for the chance to win. I love the fabric! I have just the person I want to use it to make something for…also love the flowers in the pots in your window…keep up the great work! PS I NEVER win anything! The fabrics are beautiful…I would love to win a collection of this fabric! love the fabric, have a fat quarter tower for my mom and I coming to our local quilt shop, can’t wait for them to come in!! Oh, I do love the fabric. It is gorgeous. Happiness ……. sitting at your machine and stitching away. I love the first picture, and the snowman quilt is a bonus …… gorgeous!! Love the new Snowman fabrics! Can’t wait for it to arrive in the stores. All the latest snowman projects are so cute! Snowman quilt is really nice. Hope website works out for you. I love this new line! I am already picturing several projects, and not all Christmas themed. Thank you for sharing the antique quilts. This is a lovely line! And i love your block…I have been looking for the perfect line for a winter pattern I’ve had for years. This line will be perfect! I love your work…watched you on quilting with the stars. Great show! I’m excited about the Snowman BOM, love it ! Yes !!! I would love to win this fabric ! Thank you ! Dessert Rolls are new to me, but then Moda does wonderful suprises for us quilters over many years. I am a magazine subscriber for your prim publication and love it. I love your work and would love to win this fabric. I’m a big fan out here in California and have plans to visit Wisconsin one day just so I can go to your shop! Great Snowman BOM! Love it. As well as the fabric. Very appealing! Snowman Gatherings is a great fabric line. You’ve done it again. I REALLY like snowmen and I REALLY like this fabric line! I just love snowmen, thanks for sharing today. What a great friendship quilt block! You do manage to get so much done. Thank you for your blog. Especially the cookie recipe made with the chocolate cake mix. Thankyou for the quilt pics, I can’t say I’ve ever really appreciated signature quilts until now and having just spent the last hour googling signature quilts am so very fascinated with it! I just love the snowmen. Thank you for the chance to win! I love the blue fabrics. Blue is my favorite. Thanks for the chance to win. Oh my, I LOVE this line. thanks for the chance to win. The snowmen are adorable. Thanks for sharing your creativeness! Thank you for your block, love it! This is going to make such a pretty quilt. I Love the showman fabric, it is just way too cute! Can’t wait for Snowman Gatherings! I’m currently working on fall frolic and am on the list for the Snowman BOM. Do you think the fabric will be in before Paducah? Hope so, see you there! I love the new fabric — but then, I love all the PG fabrics! Thanks for the block pattern — I’m heading to the sewing room. Absolutely love Primitive Gatherings fabric. I have the original PG fabric plus a few seasonal pieces and would love to make something out of the Snowman PG. Is winter going to end this year. Thanks tons! Thanks for sharing your block, and the chance to win. I really like the range of values in the new fabric line! I absolutely l…ove the Primitive Gatherings line and blog! I just love Snowman Gatherings and know it will be going into my “collection” as soon as it becomes available! I love Snowman Gathering is just so darn cute!! I would love to get my hands on some. Thank you very much!! Great block, can’t wait to make it. Thank you! Love your website. Love Warm Winter Blessings. Love Friendship Quilt Block. Love Everything. I love your signature block! Not to mention all your other creations. Ooooh! That last friendship quilt with the stars was so pretty. I love your site. I am a snowman junkie…. Primitive Gatherings is by far my favorite, your designs are so heartwarming. Thank you for a chance to win your fabrics. Lovely block! thank you for sharing the design. I can’t wait to “collect” your next line! I will forever erase “stash” from my vocabulary! Can’t wait for your new line to get to the stores! Thank you for your block. Love, Love, Love Snowmen and your fabric is oh so perfect!! Thanks for offering a chance at your snow fabric collection! Love your new Snowmen!! I thing they are just as cute as can be!! Thank you for the pretty block and the chance to win!